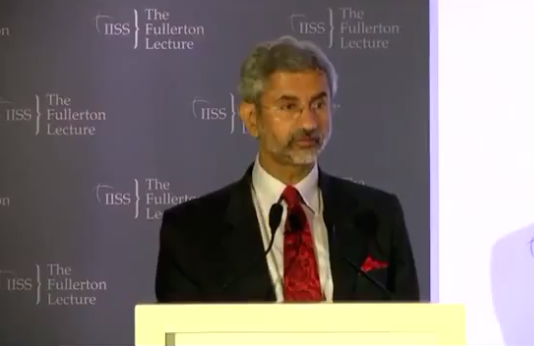 On Monday, July 20, Foreign Secretary S. Jaishankar delivered the IISS Fullerton Lecture in Singapore. Although the topic of the speech was ‘India, the US and China,’ it painted a comprehensive picture of Indian foreign policy the way the Narendra Modi government sees it. The Wire presents edited excerpts of the speech. The original text is available at the MEA website. The inter-play of India with the United States and China is among the key factors that will determine the strategic balance in Asia and beyond.Each of these states is undergoing both external and internal transformation as we speak. So, this exercise is not entirely without its complexities. I will begin with India, where the change has been sharpest in the last year. This has seen the emergence of a very different global sentiment in regard to this nation. That is a subject in itself, and on this occasion, let me limit my remarks to the foreign policy implications of a government led by Prime Minister Modi. To begin with, the approach to India’s neighbours has undergone a big shift, symbolised by the invitation extended to their leaders when the government was first sworn in. Since then, we have seen the themes of greater connectivity, stronger cooperation and broader contacts dominate India’s engagement with them. Even in a short span of time, some results are already evident. In the case of Bangladesh, it includes the settlement of the land boundary and major connectivity and infrastructure initiatives. With Nepal, the long-standing potential for hydro-electric power is beginning to be tapped. India was not only the first responder during the earthquake but also the principal contributor to its reconstruction efforts. With Bhutan, a traditionally strong relationship has been further consolidated. A sub-regional grouping involving all these countries is taking forward the connectivity and cooperation agenda. Ties with Sri Lanka after elections in both countries have increasingly focused on their national reconstruction and reconciliation. Myanmar remains our gateway for “Look/Act East” and the possibilities for cooperation grow as they open up. To India’s west, the relationship with Pakistan has its share of challenges but is part of the neighbourhood agenda that I mentioned earlier. Our Prime Ministers met a week ago and agreed on steps to counter terrorism and strengthen peace and tranquility on the border. We hope to take that forward. Where Afghanistan is concerned, managing the consequences of the draw-down of foreign forces is the primary exercise underway. India supports an Afghan-owned and Afghan-led reconciliation process within the framework of the Afghan Constitution and internationally accepted red-lines. With Iran, the resolution of the nuclear dispute and lifting of sanctions will allow our agenda of energy and connectivity cooperation to unfold seriously. Beyond the immediate neighbourhood, be it South East; North East Asia, or the Middle East, we see fertile ground that needs more sustained cultivation. Nations there seem ready to respond to a more business-like India. India’s maritime interests are significant and I would remind you that we are a nation with 7,500 km coastline, 1,200 islands and 2.4 million sq. kms EEZ. What happens to our south is of great consequence, not least because of our trade and energy imports. In recent months, considerable thought has been given to an integrated Indian Ocean strategy. It is obviously one devoted to safe-guarding our mainland and islands, and defending our interests. We seek to deepen economic and security cooperation, especially with maritime neighbours. This has been reflected in cooperation on exchange of information and coastal surveillance, building of infrastructure and strengthening of capabilities. We believe that collective action and cooperation will best advance peace and security in our maritime region. And we think that those who are resident in this region have the primary responsibility for peace, stability and prosperity in the Indian Ocean. In so far as larger international politics is concerned, India welcomes the growing reality of a multi-polar world, as it does, of a multi-polar Asia. We, therefore, want to build our bilateral relationships with all major players, confident that progress in one account opens up possibilities in others. Also of note is the more regional approach to engagement, reflected in Prime Minister’s recent visits to the Indian Ocean, Northeast Asia and Central Asia. Summit level meetings with Pacific Islands and Africa will take place in India this year. You would have already noted more energetic diplomacy that seeks a larger and deeper footprint in the world, supported by soft-power initiatives like the International Day of Yoga. The transition in India is an expression of greater self-confidence. Its foreign policy dimension is to aspire to be a leading power, rather than just a balancing power. Consequently, there is also a willingness to shoulder greater global responsibilities. This was demonstrated recently in humanitarian assistance and disaster relief operations in Yemen and Nepal. It is also reflected in our role in peace-keeping and in keeping the maritime commons safe and secure. There is little doubt that the US economy is in a recovery mode. It is probable that in pursuing its interests, the US will seek to leverage its comparative strengths that include technology, finance and its international partnerships. The issue then is the extent to which those partners have a convergence of interests. In the case of India, that is quite significant. When President Obama came to India in January, the two countries agreed on a Joint Strategic Vision for the Asia-Pacific and the Indian Ocean Region. We affirmed our shared interest in safeguarding maritime security and ensuring freedom of navigation and over-flights throughout the region. We opposed terrorism, piracy and WMD proliferation. And we urged all parties to avoid the threat or use of force and pursue resolution of disputes through peaceful means, in accordance with international law. The vast expanse of practical cooperation laid out on that occasion is also worth noting. On the economic side, there is the promise of expanding investment flows, furthering India’s digital ambitions. In areas where the US has traditionally dominated such as space, nuclear energy and R&D, new collaborative initiatives were agreed upon. The entire spectrum from defence, counter-terrorism, homeland security, intelligence-sharing and law enforcement are being taken to a new level. In global economic, political, security and technology areas, the two nations are working together on a number of issues. The deepening and broadening of the Indo-US relationship has been among the key elements of a changing Asian calculus. This process, which has unfolded unevenly in the last two decades, has definitely acquired new energy in the last year. Obviously, the two countries would not agree completely on all issues but their ability to work together is a factor worthy of serious consideration. With China, the changes are more nuanced, more complex but no less significant. Again, I use the recent visit of Prime Minister Modi to China and his meeting with President Xi to illustrate my argument. On that occasion, the terminology agreed upon by the two countries to describe themselves were as “two major powers in the region and the world”. The task they have set for themselves is to pursue their national development goals and security interests in a mutually supportive manner. Clearly, that would happen only if they showed respect and sensitivity to each others’ concerns, interests and aspirations. That the two neighbours, whose parallel if differential rise offers a somewhat unique situation in world history, agreed on a constructive model of relationship is no small thing. Past precedents in global history have been largely otherwise. This is not just a conceptual proposition. Those of you who would have watched the Modi-Xi interaction in Xian would have noted that this approach was reflected in their demeanour. The mood today allows for frank and direct conversations between the leaderships. Their shared appearances – including the world’s most powerful selfie – and utterances would have been difficult to envisage a year ago. But as with the US, it is what is happening on the ground that can make these sentiments sustainable. On the economic side, the discourse has been traditionally dominated by the growing trade imbalance, a source of unhappiness for India as it reflects lack of market access. Admittedly, that continues to be a major challenge, one that the two Prime Ministers agreed would be taken up by a high level task force. But attention has now turned to the possibilities offered by investments. Two Chinese industrial parks are under development in Maharashtra and Gujarat. Other private investment initiatives are moving forward. In fact, PM Modi’s meeting in Shanghai with Chinese CEOs probably saw the strongest foreign interest that I have heard expressed in “Make in India” in all the visits that I have accompanied him. Collaboration is also unfolding in a number of other sectors, especially in the modernization of India’s railway infrastructure. The standard narrative of Sino-Indian relations, however, remains focused on the border dispute and security issues. Here, I would draw attention to efforts to enhance communication between the militaries, promote leadership level contacts, establish more hot-lines, expand border commanders’ exchanges and create more meeting points. The political settlement of the boundary question is obviously a complicated issue. But there is recognition today on both sides that peace and tranquility on the border is an important guarantor for the development and continued growth of our bilateral relations. We are also moving to address the familiarity gap in the relationship, an outcome of the difficult parts of our shared history. My message to you today is that India engages the world with greater confidence and assurance. It does so with the intent of ensuring stronger growth, greater connectivity, closer integration and deeper harmony. It wants to expand its comonalities and manage its differences. It is prepared to shoulder greater responsibility and expects that this would be duly reflected in the structure of the international order. Kishore Mahbubani, writing of the “Great Convergence” some time ago, wondered if geopolitics would derail it. Even as realists, we should calculate that our shared stakes in prosperity and stability will temper risk-taking. After all, realism applies even more to economics than it does to security. Signals, however, remain mixed though the more alarmist scenarios have proved unfounded. Asia will no doubt go through some uncertainties before arriving at a new equilibrium. Other factors and other nations will definitely have a say too, among them ASEAN members, Japan or Australia. Shared power, if it works for all parties, will be at the heart of Asia’s emerging security architecture. And that, I believe, warrants following this triangle closely.